Heat or Eat? Which would you choose? You can help those facing tough choices! One of the most distressing choices our struggling neighbors must make is whether they buy food or pay for their utilities. In fact, thousands of families served by the Food Bank of Siouxland, report choosing between going cold and going hungry. Winter in the Siouxland area makes that decision common as heat becomes a necessity. Your generous gift now will help stock our shelves with food so that our hungry neighbors don't have to make the choice between heat or eat. Every $10 you give will help us provide 130 pounds of food. Give now & help our neighbors in need. The demand for help is very high, and we urgently need your support. 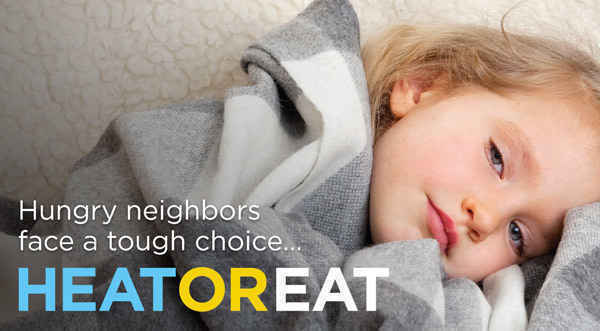 Help us ensure that there is enough food on the tables of all the 25,670 neighbors (including 11,030 children!) facing hunger we serve. Just want to help with flood victim relief. In honor of Alan Fredregill’s bday.